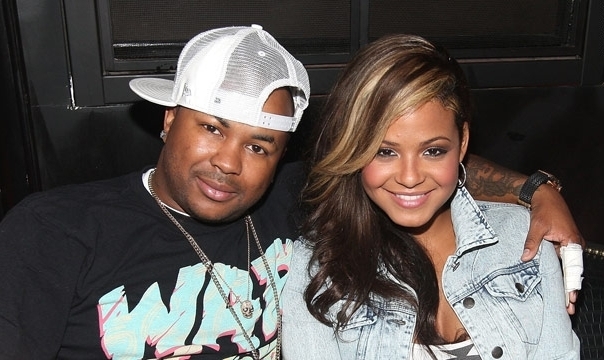 Christina Milian, The Dream Back Together? *Word has it that Christina Milian was spotted making out with her cheating ex-husband The-Dream, prompting Internet speculation that the two have reconciled. The blog Hello Beautiful says witnesses caught the two getting cozy Saturday night in the casino of the Wynn Hotel in Las Vegas while Milian was in town for the 10th Annual Michael Jordan Celebrity Invitational Celebration. Last year, the couple split up in the wake of his affair with then-assistant Melissa Santiago. Photos showing Dream and Santiago splashing about in the Caribbean hit the Internet. The-Dream filed for divorce from Milian in February, when the singer was nine days away from giving birth to their daughter Violet. Below, Christina and Violet in Feb 2011 at the Jayneoni Moore’s Celebrity Baby & Big Kid Pre-Oscar gifting suite. Her baby looks just like the daddy. CHRISTINA??? surely you ae not going to reconcile with the man who cheated on you if he cheats once he will do it again. Little Violet is adorable. If she goes back to him, she has no self-respect. It’s not just the cheating that surely will remain rampant, it’s also the entire cavalier way he treats her and the daughter — not coming to the baby shower, refusing to help with diapers, feedings, etc saying that he has money to hire help to that. He is just not a good man. Dude is just low. He’s cockroach low. She’ll go back. It’s not about not having any “self respect”! Sadly?, it’s about NOT have a damn…”job”! Nowadays?, even the HELLA fine chicks can be bought by THE most fkd UP dudes! L.London,Christina the list goes on?, & on?, & onnnnnnnn! Oh well, maybe chick has a “plan”! Fingers crossed! Ok….NO EXCUSE what so ever!? ?, but!? dude didn’t “want” the baby & it was HER idea to have it. So maybe dude is being an as-shole?, to “rebel against the reality” of the child “being here”! Just another “STUpid”, holding the actions & decisions THEY make against the …..innocent children, they make! I can’t for the fkn LIFE of me understand, WTF they don’t put a “sock ‘on their shoe”, when they’re kickin it! They knoooooow dey’s weak/insecure & cain’t turn that/ANY poonanny dooooown. So…WTF NOT protect themselves AND their money!!??? I mean, they’d “rather” bring a child they have NO intention of loving/taking care of into the world, only to lose MOE money when the mother OF said child, takes dey as-s to the “courthouse”!!?? STUpid/IGnant/disfuctional shyt!!! But hey…”freedom & all”! OMG,GFOH,NOW!!! Christina is known to be very “friendly” in the industry so it would not have been a surprise if she have gotten with him for a security net in the first place. She can’t really act and definitely won’t have another hit record too soon. So with that said, of course she will go back and if she gets dogged out again it’s because she allows it for the dollar! Poor little thing, I think she’s just naive and gullible when it comes to men. I hope that she can become a stronger and smarter woman so she can raise her daughter to make better choices than the ones she’s made.